What a delicious way to spend a Sunday afternoon! 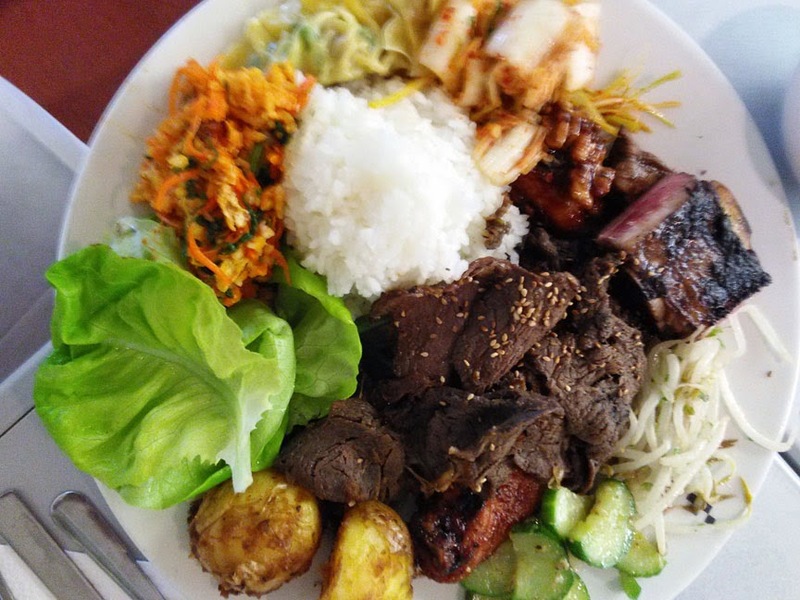 On the menu: Korean BBQ sliced beef and short ribs, sweet hot wings, seafood pancakes, seasoned Korean paella, pork dumplings, candied potatoes and a variety of traditional Korean side dishes (aka banchan). This was my Christmas gift from my sweetie... not lunch, but the Essentials of Korean Cooking class at Institute of Culinary Education with Sandy Murzin. At the crossroads of Guam, I grew up experiencing many Asian foods, Korean being one of favorites. But as with most of us islanders, I learned from cooks who never measured. That’s supposed to be a sign of a great cook, but it makes for spotty learning. Chef Sandy Murzin walks us through the kitchen essential before approaching the Korean essentials of cooking. 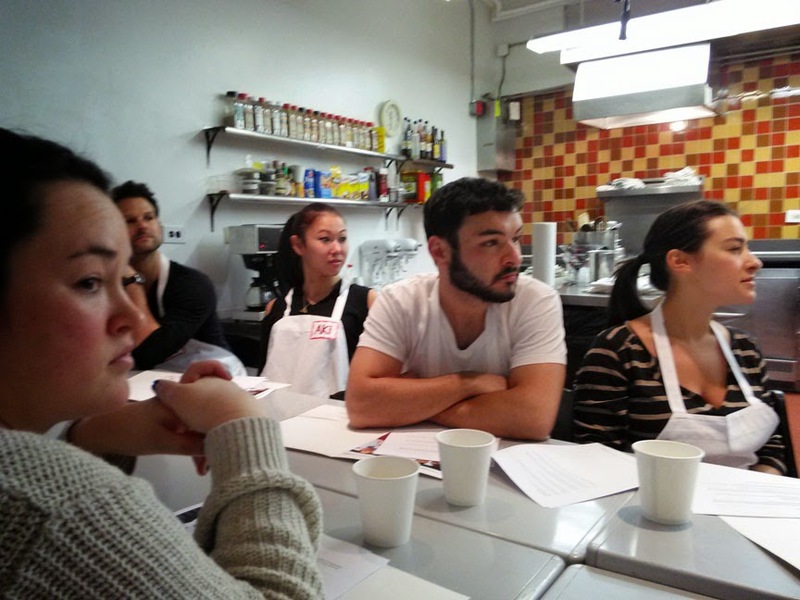 The class was very hands-on and Sandy is a knowledgeable and thorough instructor. I can’t imagine teaching 15 people with sharp knives how to cook. She reviewed all the recipes in detail— entrees and side dishes. We had an overview of cutting tools and techniques. The French mandoline slicer in particular always intimidates me; I call it “the finger taker.” I own a dinky Japanese Benriner slicer and it still intimidates me; it spends a lot of time in its box on a high shelf. It was refreshing yet challenging stepping away from the food processor. The wok is an Asian kitchen essential. Its rounded shapes serves a purpose; the sides are less hot but will keep food warm while cooking, while the bottom will reach frying temperatures in about a minute. One can make multiple meals in one pan. Here in Park Slope you’ll find many left out on the stoop for one reason: Most homes have switched to induction burners or electric ranges. A wok must sit directly over a open flame to reach a proper cooking temperature. The range at ICE is ideal; it has a an interior burner grate that allows for setting a wok lower into the range directly into the flame. Also the oven is large enough to fit a suckling pig. Three stations, 15 cooks, 12 dishes and three hours... can we do it? After reviewing ingredients and cooking techniques we split into three teams, put on our aprons, gathered at out stations and set 911 on speed dial. Luckily for we New Yorkers ingredients such as anchovy sauce and toasted sesame oil are easily found at most Asian markets. 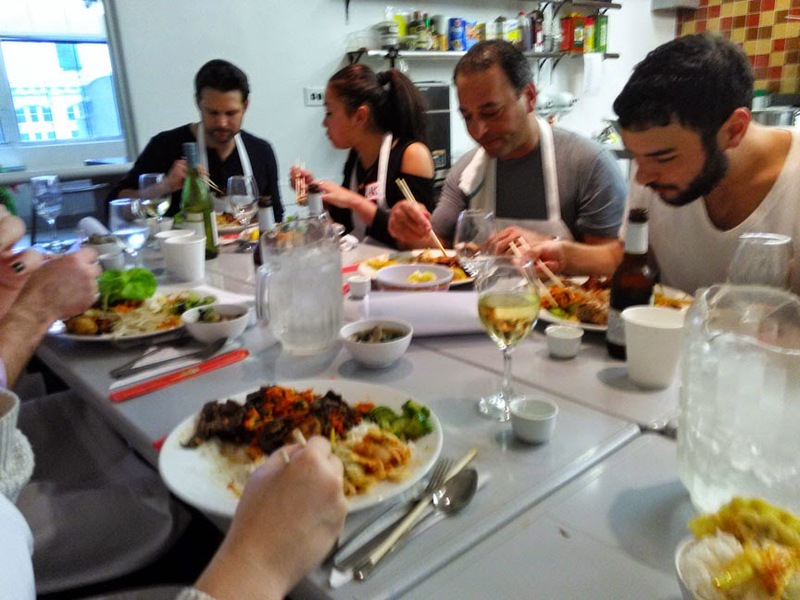 Each table took on entrees and side dishes. I have an allergy to some brands of fish sauce so I thought ahead and took a Benadril... y’never know. Korean fish sauce (aekjeot) is usually fermented and aged from one type of yellow anchovy, but some brands are consolidated with shrimp— to which I'm allergic. Aekjeot is a key flavor for many Asian dishes. “Can you make the rice?” Why is this a question? I actually hadn’t steamed a pot of rice since childhood— until about three years ago. It’s not difficult but I’m the only rice eater in this house. I was assigned to steam Asian short grain rice for bibimpbap (Korean paella) and for eating. Asians prefer the short grain polished rice over long grain— slightly sweet with a soft but very firm texture. Whether in a steamer or on the stove, polished white rice should be rinsed until the water runs clear, then rest for 10 to 15 minutes with a pinch of salt before cooking. Arguments persists about the lack of nutrients in plain white rice, but I argue that it is a prebiotic that aids fermented food... and brown rice is just really gross. Also on my task list bulgogi (Korean BBQ beef) and pa muchin, a seasoned leek side dish. Banchan (side dishes) are ubiquitous to the Korean table, at least five of them accompany every meal. 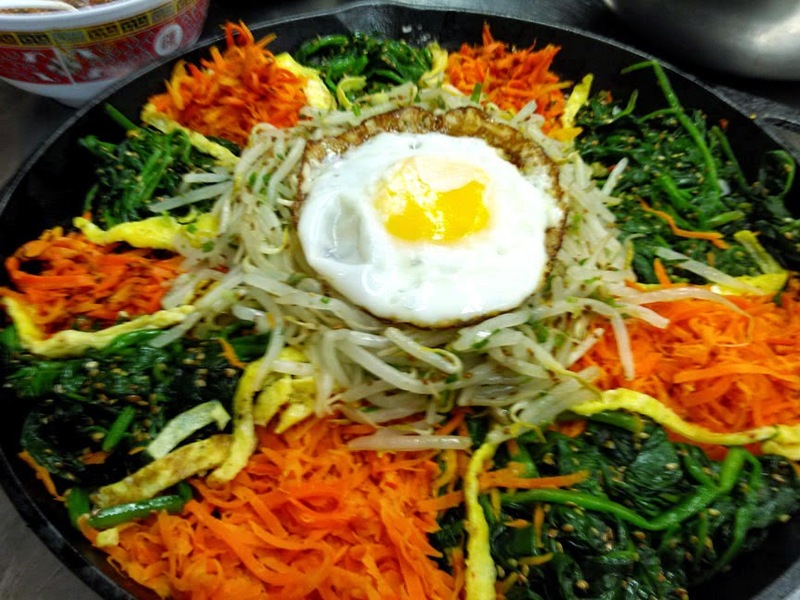 Bibimbap is served in a hot cast iron pot to crisp the steamed rice; it’s always crowned with a fried or raw egg. One key ingredient for bulgogi and sokalbi gui (BBQ shot ribs) is sweet soy sauce, which is simmered with ginger, garlic, brown sugar and a little rice wine. After it’s reduced, it’s shocked in an ice bath before marinating thinly-sliced beef with a little sesame oil and more garlic. We set these aside for about an hour or so before taking them to the grill room. Cuts of meat for these dishes should have a nicely marbled fat to get a texture that suits the tooth. Leaner cuts tend to turn into shoe leather. We used rib eye for both meat dishes. Bulgogi (left) and sokalbi gui (right) are both made with a sweet soy base, ideally these cuts of meat marinate over night. New potatoes (haetgamja jorim) are boiled and simmered in a sweet-savory sauce. Candied, savory delights are a unique to the Asian flavor profile. 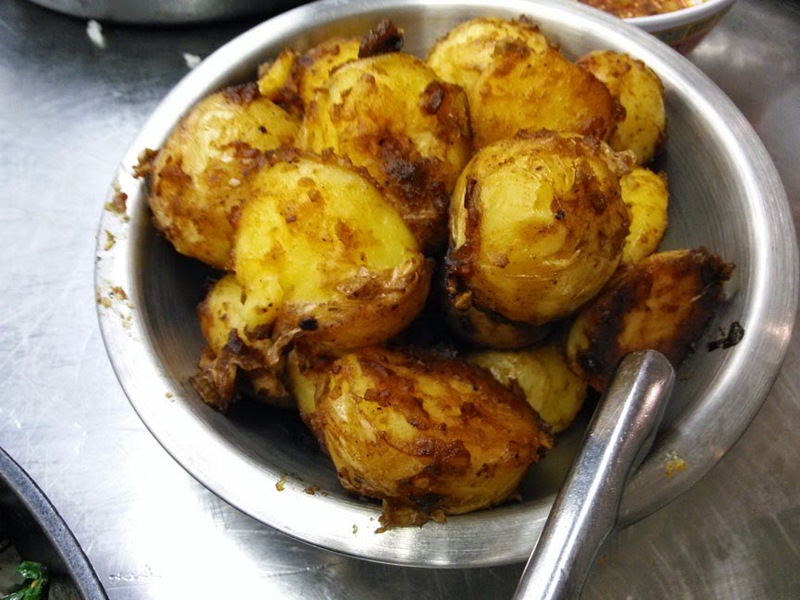 Heatgamja (potato) jorim (simmered) is cooked low and slow in brown sugar, soy sauce and crushed roasted sesame seeds. Here’s the other KFC, dak gangjeong, Korean fried chicken wings in a spicy sweet chili sauce. Dak is Korean for chicken (which confuses a lot of people), ganjeong is a sauce made from brown sugar, chili paste, soy sauce and fresh sliced chili. The chicken wings are dredged and twice-fried to give the skin a crisp, light texture. Both of these dishes are simmered until most of the sauce is thick and sticky. It’s usually cooked with walnuts, pine nuts or peanuts. 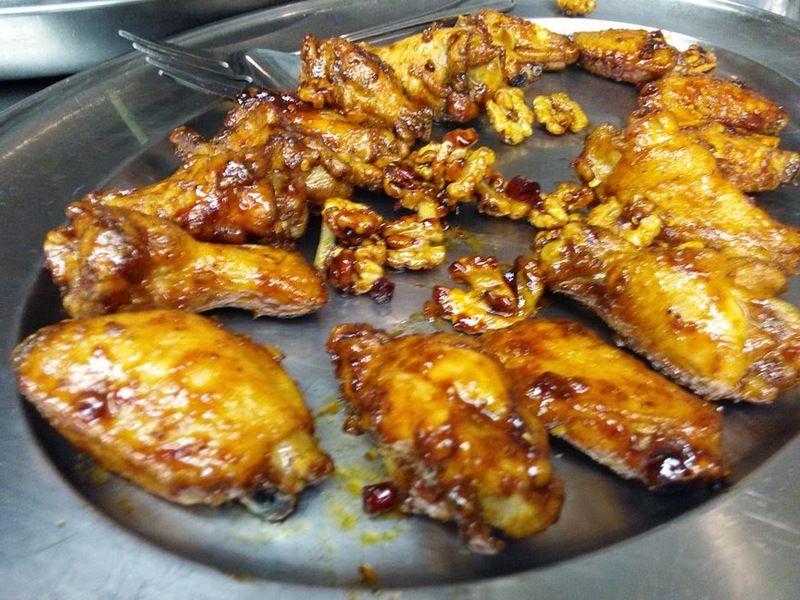 Korean fried chicken wings (dak ganjeong) in a sweet-hot sauce with candied walnuts—they taste as good as they look. Pancakes aren’t just for breakfast anymore. 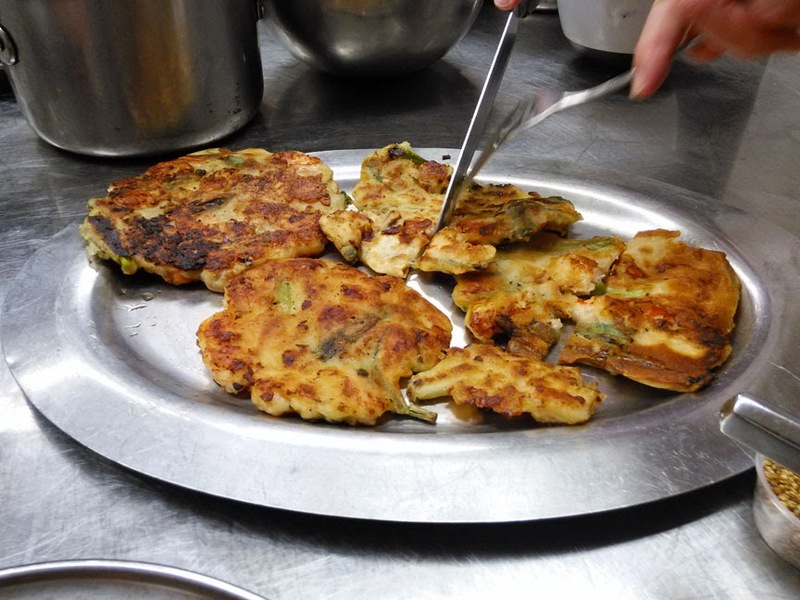 Haemul Pajeon is a Korean seafood crepe made with a combination of rice and other flours, shrimp, squid and scallops. You need a smoking-hot well-oiled pan to make these and as we found in class, new pans tend to stick. It takes about a month to properly season a new pan with regular use. Much like any pancake you have to watch for the edges to cook before flipping over, otherwise it’s a hot mess. We burnt a few in class, but personally I like well-done bits and bites more than the pancake. There are many pajeon, my favorite is made with Asian chive greens and bacon. Of all the side banchan on the table, two are indispensable: Napa cabbage kimchee and mandu gui (pork dumplings). We made a quick mak kimchee which was macerated, not fermented, but tart, spicy and full of flavor. Mandu is made with ground pork, tofu, beef, mung beans sprouts and seasoned with oyster sauce, garlic, shaved ginger and dark sesame oil; they can be steamed or pan fried. I like them deep fried and crisp and served with soup. You can make and freeze mandu ahead of time for larger meals. My mother always kept a bag of shumai in the freezer just in case guests dropped by. Mak kimchee and mandu gui are made fresh deliver quick one-two punch between bites. Three hours flew by, and much like the cooking shows someone is always just plating food in in the last two minutes. A hungry crew sat to enjoy hours of hard work. I almost forgot to mention the cucumber flavored soju, a sweet potato vodka with a kick. These recipes were adapted from The Korean Table by Taekyung Chung and Debra Samuels. Also check out Eating Korean by Cecilia Hea Jin lee. For classes and more check go to www.ice.edu.